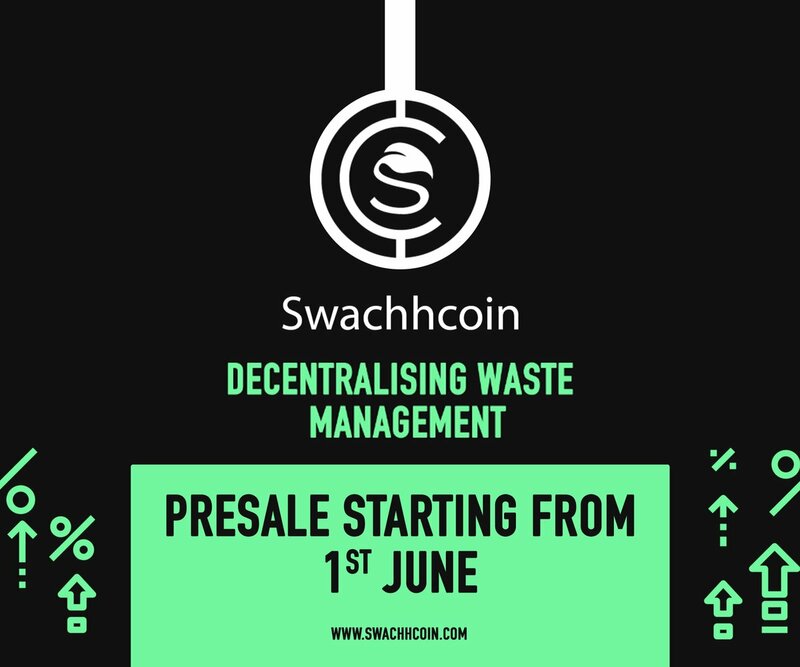 Swachhcoin has a disruptive vision of completely overhauling the waste management sector globally to overcomethese issues through its sustainable, rewarding, profitable and technologically advanced ecosystem. We at swachhcoin believe that waste is the greatest untapped resource present in abundance all around us and a lot can be done by the present and future generations to overturn the prevailing mindset of the masses towards waste. We have brought together a number of advanced technologies that will work in sync with each other and will be offered to any existing waste management industry adopting the Swachhcoin platform. Some of the tools offered are: SWATA, SWATEL, SWIOT which stands for Swachh Big Data, Swachh Adaptive Intelligence, Swachh Internet of Things. There is also SWBIN and SWAPP, which stands for Swachh Bins and Swachh DApp. Individual users will be rewarded tokens for disposing of waste in SWBIN, thus encouraging proper waste disposal. The waste collected from the SWBIN will be transferred to state-of-the-art processing facilities to extract useful products of high economic value from, which will be made available by the people in exchange for tokens. What is your plan for a successful operation of the business? Swachh Foundation is a non-profit organisation which aims to overhaul the waste management sector by acting as a complete technology developer and service provider. Swachhcoin binds together the waste contributor, waste processor, and the processed output buyer in a mutually beneficial and sustainable ecosystem through developed tools and technologies. A waste contributor disposes of their waste in Swachh Bins and in return they receive monetary benefits from the waste processing industry. The waste processing industry converts the waste into products of economic value that are ultimately sold to output buyers which can range from industries to retail buyers. The range of output products is vast which includes fuels, electricity supply etc. Swachh Foundation receives 1.5% of the reward that the waste collection agency pays to the waste contributor when they dispose of the waste in SWBIN. Additionally, Swachh Foundation also receives 4% of the price a user pays when they choose to advertise on SWBIN(LED Panels on SWBINs feature decentralized advertising which becomes available through a bidding process where users can pay in Swachh Tokens through SWAPP (Swachh Dapp)). The revenue generated through these sources will be used for philanthropic causes and will also cover day-to-day Swachhcoin running and maintenance costs. It is the truth that world is becoming encumbered with garbage despite strong efforts and awareness campaigns to combat its growth. The problem is lack of motivation in citizens to take responsibility to manage their waste properly so we came up with the solution which is our reward system, rewarding people for taking the initiative and to manage waste at their end. This is the single most crucial factor to curb the impending crisis of waste management. We believe that this can, over a period of time, bring a significant change in the behaviour of a large population where they become more responsible for their own waste disposal. There is a need for a waste management ecosystem, completely different from the current one, which can be offered in numerous ways. their disposal, thus producing high quality product with maximum productivity. When was the company launched? Where have you reached? The organisation was officially formed on 6th April 2016. Since then we have expanded our team to 31 full time working employees. We have concluded our Initial R&D, Market Survey and are now in the planning phase of organising our crowdfunding. Swachh centres are being established in 12 cities including Delhi, Kolkata and Bangalore. After the crowdsale, we will start working for our first deployment, scheduled in Q2 2019, while continuing the ongoing Tools developments. We are soon planning to reveal the first version of Swachh Bins (SWBIN) next month. We are backed by industry leaders at Community Tech Labs, Mr. Varad Shambhawa and Mr. Rishabh Jain who have committed an undisclosed amount of Ether in the private round. We are also in talks with United Nations representatives to support their Sustainable Developments Goals based on their guidelines and soon look forward to becoming official partners. Also, we are proud to have more than 36 thousand members on our official telegram group who support us in our noble mission. We had our Private Sale held for institutional investors and VC’s from the 31st of March 2018 to the 20th of May 2018. The funds raised will primarily be utilised for extensive campaign we have ahead of our Presale. We have partnered with various organisations to help us through different phases of our project. We recently announced a number of our strategic partners and more will be announced as we move forward in sync with our project development timeline. A wide range of organisations have appreciated our concept and vision and have wholeheartedly come forward to collaborate with us. We are happy and excited by what we have accomplished so far. The industries will have a wide range of outputs including electricity, fuels etc. These kinds of products are necessary for day-to-day activities and are limited. We are not trying to attract people, on the contrary, who will meet the demand for these resources in the market to a significant extent. Moreover, we incentivise people to be responsible for their own waste. We aim to create a global, decentralised waste management network with the goal of harnessing the maximum potential of waste as well as utilising the developed technology used in industrial deployments throughout the globe. In the meantime, we will also be aggressively expanding our Swachh centres from 12 to over 100 cities in India by the end of Q4 2018. We have the ultimate aim of first platform deployment in Q4 2019. We are active on various social platforms such as facebook, Twitter, LinkedIn, Instagram, Bitcointalk, Telegram, Reddit etc. and post our updates every now and then. For further queries go to our website www.swachhcoin.com and mail us at [email protected] . Our team’s personal contact is available on our website.